Well, well, well, lookie here, a menu post. And on time, even. I guess the fact that I planned two weeks last week really helped when I wanted to think about planning this week. Know what also helped? Menu plan break-down. It's just that time of year y'all. I don't have time to cook and I don't feel like cooking. Which means some of last week's meals didn't get made and I pushed them to this week. 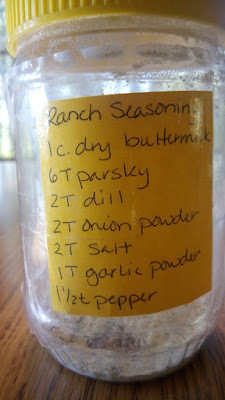 This week I'm making ranch dressing mix and taco seasoning, because I'm almost out of both. I make them in batches and store them in empty peanut butter jars. I wrote out the recipes and taped them to the jars so when I'm running low and want to make more I don't have to look up the recipe. 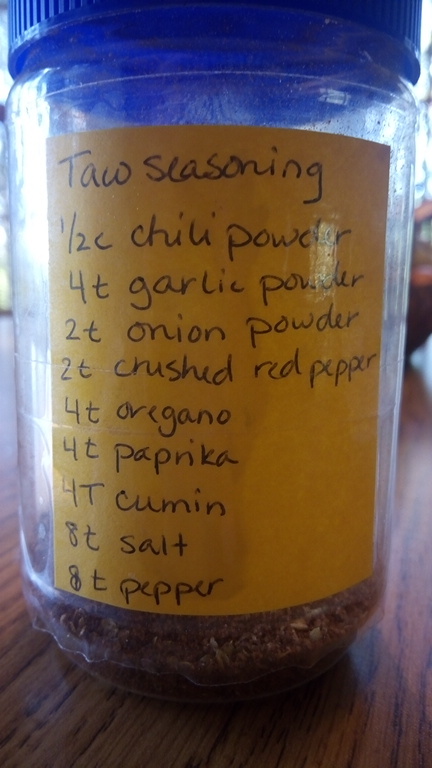 Seconds count when one is running out of taco seasoning. I'm also making brownies and cookies this week. Because Bubby is playing on a traveling soccer team this year, we are required to work a certain number of volunteer hours during the season. There's a tournament this weekend, and I found out that they would give me credit for one volunteer hour for every dozen individually wrapped baked goods I brought to the tournament to be sold. This is sooo in my wheelhouse, so I immediately grabbed enough cookie and brownie spots to fulfill our volunteer requirement. Eight dozen brownies and chocolate chip cookies, coming right up.